I’m winding down to my long overdue vacation. Lately, I feel like I’ve been shooting into the fog, hoping to hit something. The final round of agent submissions felt like that. The attempts to heal my sciatica have felt like that. No targets hit so far, and worse … I can no longer see where the targets are, or what they are. Weariness from a year of constant pain has fogged it all over. So I’m off for two weeks, to relax, recharge, and re-focus. To keep myself going until that break, I decided to play around with the Gunning-Fog Index and the Flesch-Kincaid Test this week. You could be forgiven for mistaking them for obscure titles of gripping thrillers, but actually, they are metrics for grading the readability of text. It’s based around sentence and word length. I applied it to some chapters of my novel. The readability was quite good, but by adopting some of the change suggestions from Edit Central, I found I could improve every chapter by almost a further point, which brings it comfortably into my target audience range. I might apply it to the whole novel when I return. Tighten it up even more. I wouldn’t recommend applying it blindly as an editing technique. It’s just interesting, that’s all. It makes me more aware of my style, and where it could trip up a reader. It made me think of even simpler, clearer ways to compose some sentences. The most interesting thing of all, for me, is that readability was hardest in chapters where certain people were talking. This is mainly because those people would be having some technical conversations (with lots of multiple syllable words like ‘forensics’ or ‘genetics’). I could almost tell which chapter it is by the readability index alone. (I’m too damned close to this thing!) Is editing ever truly finished? Or am I just gilding the lily at this stage? Time to let go. Ah well – holiday time too. Back in a couple of weeks. You may have noticed that I like a nice metaphor. Here comes this week’s! I’ve been editing for the past couple of weeks. It’s true what they say – it’s easier to edit with a little bit of distance between author and novel. I’ve left it aside for a few months and it makes me more willing to make the hard decisions to cut out the unnecessary fat that gets in the way of a story. It seems to be following the 10% reduction rule of its own accord. It becomes strangely liberating in a way, once I get used to letting go of those precious phrases that don’t really belong. There is a danger. I’m intensely careful of stripping the prose back too much, to some mundane, bland, anonymous thriller style that could be the output of any ghost writer. That brings me to my metaphor. Ask any chef – a little fat gives the dish more flavor in the cooking. Don’t trim it back too much. You see that? That’s me destroying the planet, that is. That stack represents all the paper used by one draft of my novel. That’s only one draft, mark you. No, it’s not a doorstop novel either. 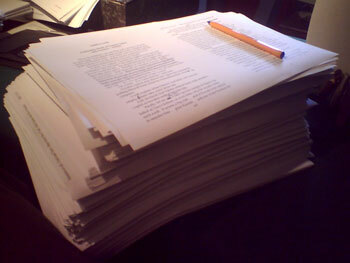 That stack holds an editing copy for me, another copy for beta reading, and returned submission material. I reckon there’s a nice thick cross-section of tree trunk in that pile – and it’s just one of many. Is there any remedy to my proclivity for planetary destruction? “Buy a Kindle for editing – it would save paper,” my eco-conscience cries. But would I even use a Kindle for editing? No. Until it comes with a stylus that allows me to scribble on the page in multiple colours, draw smilies, pen insults to myself, and connect lines drawn between pages, then it just doesn’t have the kind of flexbility that I need when editing. Sometimes we writers are beaten over the head by the amount of paper we use (which in my case would leave me concussed). The writers among you might notice that the top page of my stack is not printed as the standard double-spaced single page editing format. For my personal edit copies, I prefer to print two pages per A4 sheet. Why? Is it to save paper and save the planet? No. I find it easier to edit text which is laid out as a final novel. I just sense better what writing works and what doesn’t if I’m reading it as a book. I think it’s a psychological (not an ecological) thing; if I feel I’m reading my words in a printed book, I’m less inclined to let myself away with anything sloppy. You know – something that I might cringe at years later if I saw it in one of my published books. “My published books” – sigh – well, a guy can dream. Can that day ever come, I ask myself, if I continue to destroy the planet with my accursed words? Now, if you’ll excuse me, I’ve got some recycling to do. Update … Good News Everyone! Last week I received some good news – an agency, having read my full manuscript, is interested in it. It will require more agency-assisted editing, but that too is good news; they like the novel enough to invest time in helping me make it better. And it’s a big name agency too! I’m like a jitterbug anticipating their suggestions. I took the novel as far as I could under my own steam, and while I know it’s good, at times I wondered just what it was that I had created — that can happen when you get so close to a project. Already, I have an insider’s perspective on its market genre. Wonderful. It’s invigorating to — finally — have enthusiasm for my novel shared by someone in the business. A glimmer of hope in an morass of economic woes. The hurdles are yet legion: pending the edits, it still has to become a formal offer of representation; the agent needs to entice a commissioning editor in a publishing house; an editor has to sell it to a pitch panel. In this business, I know only too well from my own experience that one can fall at any of the hurdles. But most are largely out of my control. The only thing I can control now is the quality of the novel, to make it the most irresistible prospect I can, and with the help of an agency, I can do even more about that. But that is all next year’s concern. Best of all in this is my internal victory, and the satisfaction it spawns. I have been vindicated. I took the decision to re-write a new draft, rather than start a different novel. I felt passionate about the subject matter and that I could tell the tale in a way that would sell. I believed it important also to learn to whip an errant novel into shape – it is a skill I would need as a writer. I have pulled apart and re-assembled an improved novel that made it over the next hurdle. Having done that, I feel confident that I can handle any edits that now come my way. This week, I have been mostly … plotting. I’ve been sitting here in my artist’s garret this week, plotting. All that I’m missing is a white feline to stroke menacingly. I did escape my lair long enough to go see Quantum of Solace, but that is a whole different blog post. No, this is about plotting of a much less threatening kind. In my day-time career there is a principle that transfers nicely to my shadow career of writing. In the cycle of software development, the earlier in the design process a problem is detected, or a requirement gathered, then the less costly it is to fix it or implement it. It stands to reason. If you discover towards the end of writing software code that there is a problem — something that wasn’t thought of sooner — then significant chunks of it have to be re-written, interfaces to other systems need to be altered, tests have to be run again, and man-hours spent writing the original code have to be written-off. All this affects the bottom line. That is why successful project managers on large software projects are so fastidious about requirements gathering. So too in writing. It’s striking to me how many parallels there are between the process of writing software and the process of writing a novel. My first novel taught me the importance of having a sound plot outline before a word of prose is committed to paper (or to hard disk platter). It had to be re-drafted to repair plot deficiencies and that took a lot of my man-hours. But, a story outline can’t be worked out totally in my head; sometimes a few scenes need to be drafted and played with to get the feel of characters, and how they might interact. There is a parallel in software for this too – it’s called a “prototype”, or a “proof of concept”. It the writing world, I think it’s called NaNoWriMo! Do something quick and dirty to see if it works, or how it works, or what the implications will be. Then take what you’ve discovered and add it to the master design. With my second novel, I want to start similarly streamlining the writing process (insofar as a creative process can be streamlined!) If I do get to churn out novels for a living, then I’ll need to take on-board what I learnt about writing Broken Evolution and reduce the number of drafts needed to produce a novel, if I can. Well, you’ve got to laugh, haven’t you? If I can’t find fun while doing this, there’s no point doing it at all, because it’s improbable I’ll be doing it for the money (although more about that in a later post)! Fun – that’s another thing I want to inject into this new novel. My new protagonist is going to be a bit of fiesty fun for the reader. It’s invigorating having a blank creative slate again, after rounds of revising and tightening and editing the same story over and over to make it as refined as possible. A new novel is a fresh playground where I can go anywhere and anything is possible. That’s at the start, at least. Creativity is a process of harnessing inspiration, and slowly circumscribing it with boundaries created by the choices a writer makes. That’s where a story outline begins – with infinite horizons. It very quickly needs to start having its wings clipped. © Copyright 2019 Brendan Cody’s Blog. All rights reserved.